This happened to me last summer. It was a display of hummingbird feeders, on sale for five bucks. Such a deal. So I bought one, along with a big bottle of bright-red specially-formulated commercially-produced hummingbird nectar (five more bucks). Went home, took the feeder apart, washed it according to the manufacturer’s directions, filled it with the red stuff, hung it on a shepherd’s hook in the front yard, and went in the house to watch the birds flock to the new feeder. Nobody came. Not one bird. A few days later, my husband found a dead one in the driveway. I have no idea what happened, but I surmised that perhaps hummingbirds are better off avoiding bright-red specially-formulated commercially-produced hummingbird nectar. I poured it out, discarded the rest of the red stuff, washed the feeder, and found a recipe online for homemade hummingbird nectar. It’s not hard. Four parts water, one part plain old regular granulated table sugar. Bring to a boil, cool, pour into feeder. No dye necessary. OK, I made up that last part. Oh, wait, I mean, I made it all up. But seriously, they were polite. They all got along just fine, and there was plenty to go around. Alas, but that was last summer. Things were going OK this summer, too, until a few weeks ago when a new hummingbird moved into the neighborhood. At first, I was really pleased—this one is a ruby-throated hummingbird (the only kind I can identify), and he’s breathtakingly beautiful. Unfortunately, he’s also a selfish, boorish party-pooper, like the kind of neighbor who never bothers calling the cops when you have a party because he’s a vigilante who takes the law into his own hands and scares away all your friends. Yep. This beautiful, much-revered ruby-throated hummingbird, his greens shining in rainbows like oil on water, sits on a twig near the feeder when he’s not even hungry and chases all the other hummingbirds away. You can hear him buzzing at them. “MINE,” he’s saying, like the seagulls in Finding Nemo (“Mine! Mine! Mine!”), except they’re funny, and he’s not. The polite hummingbirds never challenge him, even though they were here first. They just wait and come back when it looks like he’s not around. But even when he’s not sitting guard on his twig, he’s always somewhere nearby. They never get closer than about three feet from the feeder before the ruby-throated vigilante comes swooping in from who-knows-where like an insane dive bomber. It became apparent that drastic action was necessary, but I didn’t know what to do. You can’t just put a feeder outside and then go running out there yelling, “SHOO!” every time you see the wrong bird. And I didn’t want to just take it down. When a selfish person is hogging all the goods, you don’t remove the goods so nobody else can get any either. You have to have a plan. So I went out yesterday and bought a second feeder. Set it up clear across the yard from the first one. I’m waiting to see what’s going to happen. Will the polite birds organize, maybe send a decoy to one feeder while the others feed at the other? Will the vigilante exhaust himself trying to guard both? I don’t know. Whatever happens, it won’t be long before all the hummingbirds start heading south, and both feeders will go back in the cabinet until next spring. I just hope the polite birds get enough to eat before it’s time for them to leave. UPDATE: I did a little checking this morning–and guess what? 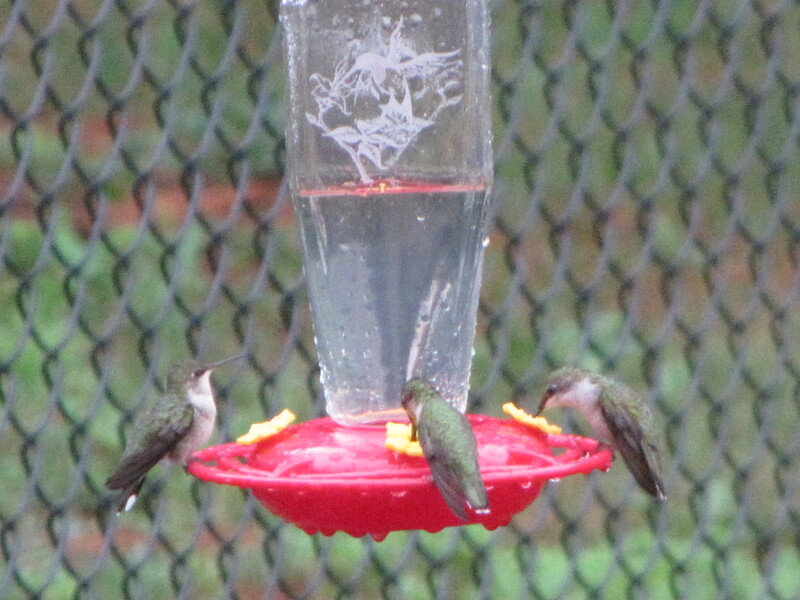 It looks like they’re ALL ruby-throated hummingbirds. The polite ones are female, and the vigilante is a male. If this is the case, I can’t help wondering–What is this dude thinking? That is so not the way to catch women! Take a look here and see what you think!